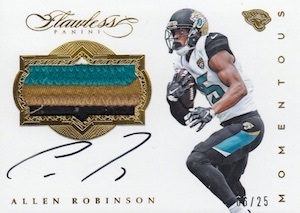 Assuming the role of the most high-end option among the premium NFL sets, the 2016 Panini Flawless Football checklist chronicles the '16 season with only on-card autographs (or limited cut signatures) and other quality hits. Every box delivers six signed cards along with two memorabilia inserts and two cards featuring real gemstones. Like everything associated with the brand, Flawless does it big. That starts with the base set that contains diamonds. In addition, new jewel-based options include one-of-one Team Gems and NFL Shield Gems with combo diamonds, emeralds, rubies and sapphires arranged in unique shapes. Among the hard-signed inserts are new Shield Signatures and Symbolic Signatures cards with premium NFL shield or brand logo pieces. 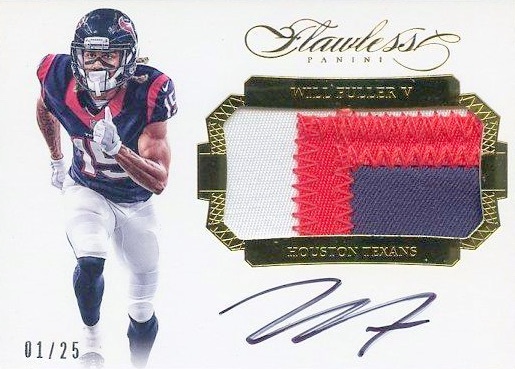 The Flawless Finishes Autograph set honors the memorable moments in NFL history while Greats Patches Autographs doubles up relics for all-time greats. 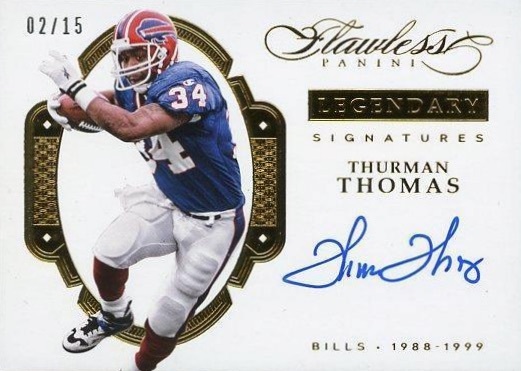 The only autograph set not actually signed on-card, Flawless Cuts showcases cut signatures for legendary former players. 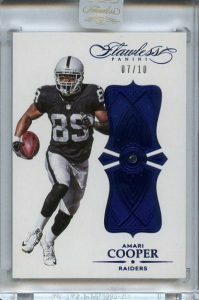 Featuring a low overall print run, the majority of the sets in 2016 Panini Flawless Football also offer Silver, Ruby, Sapphire, Emerald and Platinum parallels along with the base edition. 1 1 RC AUTO BGS 9 10 MICHAEL THOMAS 2016 Panini Flawless *ROOKIE EMERALD #'D 5! 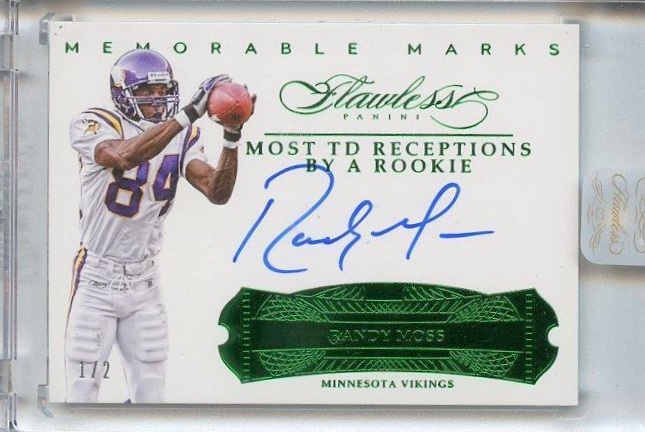 Shop for available 2016 Panini Flawless Football cards on eBay. 145 cards. Serial numbered #/20. Shop base gem cards on eBay. PARALLEL CARDS: Ruby #/15, Sapphire #/10, Emerald #/5, Platinum 1/1. 24 cards. Shop on eBay. PARALLEL CARDS: Silver #/20 or less, Ruby #/15 or #/5, Sapphire #/10 or #/5, Emerald #/5, Platinum 1/1. View specific parallel print runs with the full spreadsheet. PARALLEL CARDS: Silver #/20 or less, Ruby #/15 or less, Sapphire #/10 or less, Emerald #/5 or less, Platinum 1/1. 25 cards. Shop on eBay. PARALLEL CARDS: Silver #/20 or less, Ruby #/15 or less, Sapphire #/10 or #/5, Emerald #/5, Platinum 1/1. 55 cards. Shop on eBay. PARALLEL CARDS: Silver #/20 or less, Ruby #/15 or #/10, Sapphire #/10 or #/5, Emerald #/5 or less, Platinum 1/1. 21 cards. Shop on eBay. 22 cards. Shop on eBay. 16 cards. Shop on eBay. PARALLEL CARDS: Silver #/20 or less, Ruby #/15 or less, Sapphire #/10 or less, Emerald #/4 or less, Platinum 1/1. PARALLEL CARDS: Silver #/15 or less, Ruby #/15 or less, Sapphire #/10 or less, Emerald #/5 or less, Platinum 1/1. PARALLEL CARDS: Ruby #/15 or less, Sapphire #/10 or less, Emerald #/5 or less, Platinum 1/1. 30 cards. Serial numbered #/25. Shop on eBay. PARALLEL CARDS: Silver #/20, Ruby #/15, Sapphire #/10, Emerald #/5, Platinum 1/1. PARALLEL CARDS: Ruby #/15 or less, Sapphire #/5, Emerald #/5 or less, Platinum 1/1. 17 cards. Shop on eBay. PARALLEL CARDS: Silver #/20 or less, Ruby #/15 or less, Sapphire #/5, Emerald #/5 or less, Platinum 1/1. 36 cards. Shop on eBay. PARALLEL CARDS: Silver #/20 or less, Ruby #/10 or less, Sapphire #/10 or less, Emerald #/5 or less, Platinum 1/1. 15 cards. Shop on eBay. 9 cards. Serial numbered 1/1. PARALLEL CARDS: Silver #/20 or less, Ruby #/15 or less, Sapphire #/10 or #/5, Emerald #/5 (Prescott #/3), Platinum 1/1. PARALLEL CARDS: Silver #/20 or less, Ruby #/15 or #/10, Sapphire #/10 or #/5, Emerald #/5 (Lynch #/3), Platinum 1/1. 55 cards. Serial numbered 1/1. Shop on eBay. 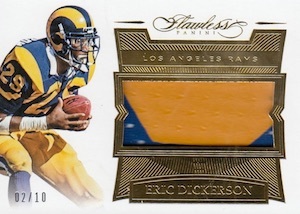 PARALLEL CARDS: Silver #/20 or less, Ruby #/15 or less, Sapphire #/10 or less (No Fitzpatrick*), Emerald #/5 or less, Platinum 1/1 (No Peterson*). 55 cards. Serial numbered 1/1. 10 cards. Serial numbered 1/1. Arguably the worst return on investment. Maybe, maybe 1 card worth $100 in a box. Yet, paying an average of $170/card. Even if one pulled a Dak /20 RC and a zeke RPA in the same box, it would be borderline getting money back. People already crying about cash returns on boxes???????????????? You buy a case to get the cards you can’t afford, like 1/1 Brady. Buy singles you want, or don’t buy, but don’t be a baby either. I have never seen such unbalanced cases of cards to this. Some full cases are loaded, while other cases have only a few cards with half the value of the case. 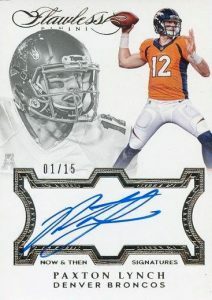 Cut autos which people are now sick of, and unbalanced number of rookies per box. The team must have surprised some buyers with the best of the best, while leaving others feeling ripped off. I am disappointed in this product and will never buy cards from it again. 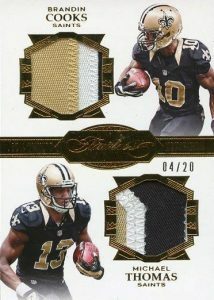 I’m giving this a 4star because in one case break I got 2 Michael Thomas patch autos and a brees gem base for $55. While others through the case breaks spent over a grand and didn’t get anything. I consider my self one of the lucky few. IMO in case break only 5 of the 32 teams will hit something worth the money so that’s about 18% chance. Better to pick the ones you want on the second market. To Mr. Clack I watched a breaker break 5 cases and not one 1/1 came out. I watched someone do a private break and 3 1/1’s came out. So buying a case does not guarantee a 1/1 or Brady 1/1. The risk for the reward is not worth it. You buy a case for a shot in the dark. To finally get a product without sticker autos from Panini cost me 1.3k $ per box, no thanks! I also can’t see the appeal at all in Flawless. 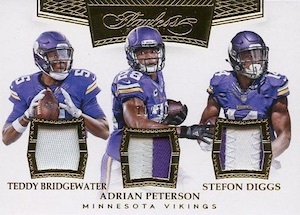 Some might see the overall white design as very classy, but Impeccable, Immaculate, Encased and National Treasures feature all a very similar card design so I think they’re lacking a lot of creativity for their flagship product. Panini also tries to make everyone believe that there’s an extremely low print run on all the inserts, but actually almost all of them have 5 parallels and to have them as Silver, Ruby, Emerald, Sapphire or Platinum doesn’t really add any value. If you get a Giants card in Emerald (Emerald is actually just green, but Emerald sounds way more fancy) it looks extremely ugly, the same is a Packers card in Sapphire or a Saints card in Ruby, it’s just damn ugly. Also every insert has a 1 of 1 parallel which makes it around 500+ 1/1’s in this product? That’s just crazy! With Football generally not doing so well, I think there’re plenty of other reasons why Flawless isn’t selling high on the secondary. A box of Flawless isn’t even close to be justifiable for a personal break, as a collector you’ll hardly get what you want and as a seller it’s almost impossible to break even with a box or case. I just wonder for how long group breakers will keep this product alive, even a notorious gambler can’t see any value in Flawless and the late checklist releases should also be a huge red flag? 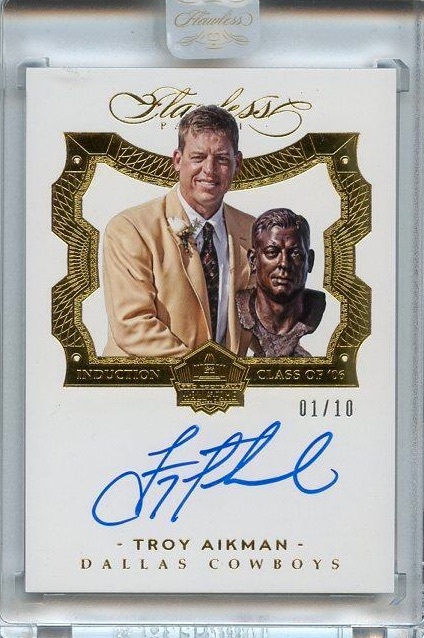 I mean what is the appeal to pay 400-500 dollar for a Cowboys slot in a break, to have a very small chance for a card which is worth � well 400-500 dollar? I just don’t get it! I gave 1 star because as an average collector I’ll never be able to afford half a box, much less a full box of this product. I guess if it still sells then Panini will keep releasing. I’ll stick to $100-$200 boxes to try and pull a Dak or Zeke that could easily have the same value as a Dak or Zeke from this product. My hope is that eventually everyone will quit buying these types of products so panini will stop producing these type of products. How in the world is a 12/13 year old kid supposed to afford $1,000+ for a box of 8 cards!?!?!? LOL!!! I loved Flawless from years prior, but these cards are ugly. The basic autos look like cheap foil stamps with no design or edge to them. I guess since Dak and Zeke are so valuable they threw some cheap junk together since they knew everyone would be chasing them. Just ugly cards, similar to last year’s but with less color and flair. Sadly disappointed. I’ll pass till next year, not worth half the price. Love this product!! 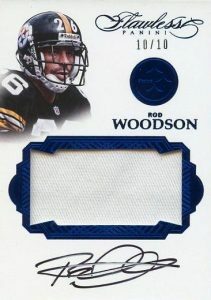 I like the low serial # count the different colored windows and the on card autographs and the all white background which gives it a super nice and clean look. 2016 Flawless Factory Sealed Football Hobby Box Carson Wenrz AUTO RC ? ?